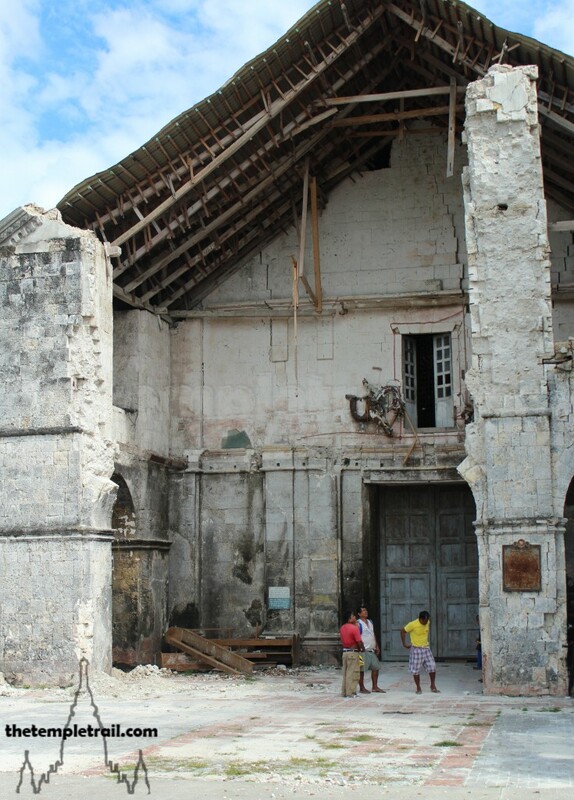 The terrible earthquake in 2013 left the island of Bohol picking up the pieces of its heritage. The ancient stone churches,which are so symbolic of the Philippine island, were shaken to their foundations. Some fared better than others, but all of them saw damage. As iconic as the Chocolate Hills and the big-eyed tarsiers, the Stone Churches of Bohol have been dealt a powerful blow by Mother Nature and what happens next is still up for debate. 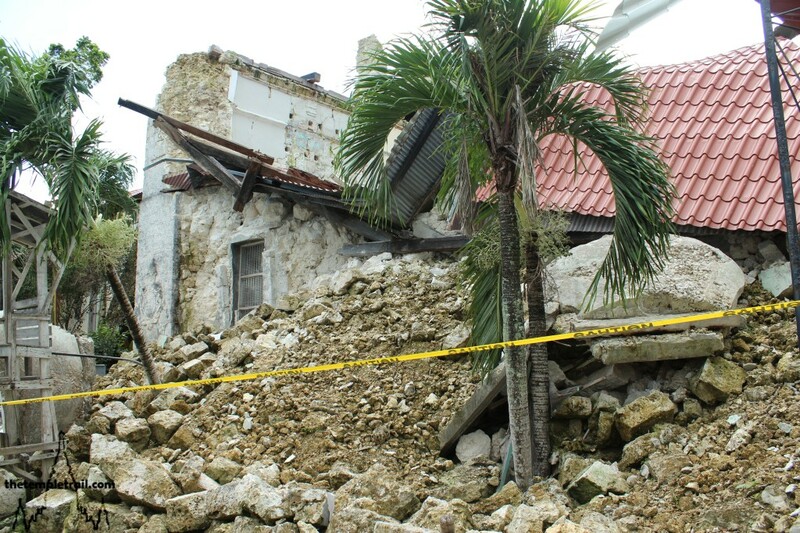 The earthquake was far reaching and actually affected nearby Cebu also, damaging the famous Basilica del Santo Niño there. Fortunately, the damage was minor compared with that on its neighbour. While there are a number of churches on Bohol, there are a handful, built between the 18th and 19th centuries that stand out. 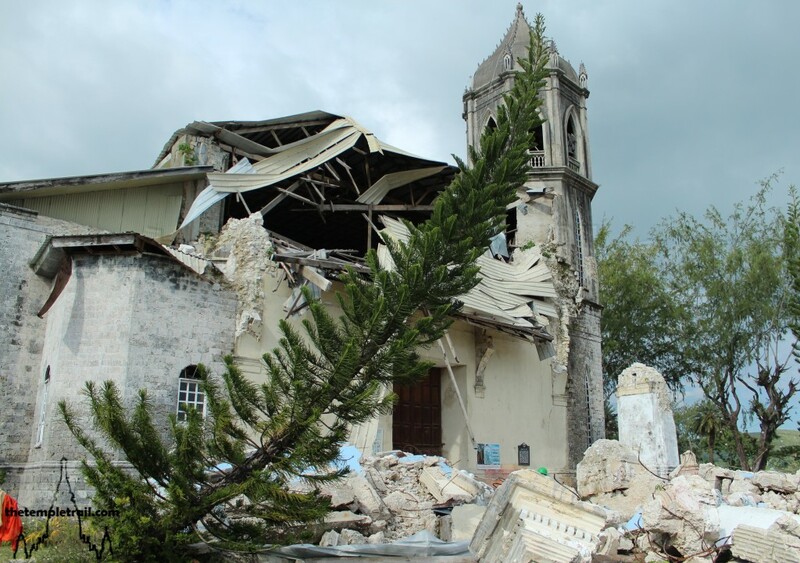 Some, like the Church of the Most Holy Trinity in Talibon were relatively unscathed by the quake, but others were not so lucky and were entirely razed to the ground. The Santa Cruz Parish Church in Maribojoc, for example, was turned to rumble. Bohol has had a turbulent history. Many have colonized the island, starting with the Eskaya people (now a small minority), who were then followed by the Pintados (Painted Ones). The tattooed settlers are the ancestors of the current inhabitants, but it was the Spanish who were to have a profound impact on the culture of the island. When the conquistador Miguel López de Legazpi made a blood compact (the Sandugo) with Datu Sikatuna, the local chief, in 1565, little did the local Boholanos know that their world would drastically change. The Sandugo paved the way for Spanish colonial rule and years of insurgency, starting with the Tamblot Uprising in 1621. From 1744 to 1829, the island went through the Dagohoy Rebellion, the longest in Philippine history. While the Tamblot Uprising was a religious reaction to the encroachment of Catholicism on the native religion, The Dagohoy Rebellion was caused by the cruel manner in which the Jesuits ran the island. The uprising outlasted the Jesuits and continued through into the administration of the Augustine Recollects. It is against this backdrop that the iconic stone churches were built, mainly by the more peaceful Augustine Order, who went quietly about their affairs, unlike their more radical Jesuit predecessors. While the period was destructively violent politically, it was constructively creative for the church builders. Many stone churches sprang up all over the island. 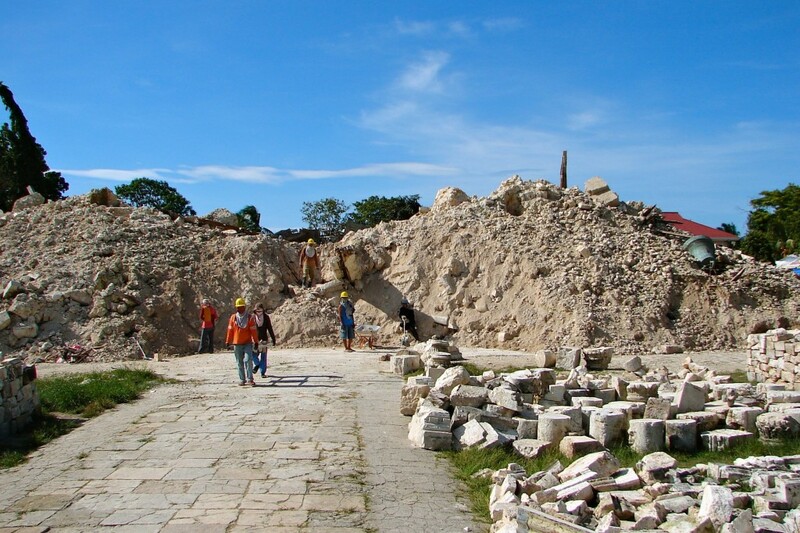 As the area is a natural disaster epicentre, with numerous earthquakes and typhoons, damage has been dealt to almost all of the structures over the years, leading some to being rebuilt on more than one occasion. So when, on the 15th of October 2013, a 7.2 magnitude earthquake struck, it was not unusual. The sheer amount of damage, however, was shocking. 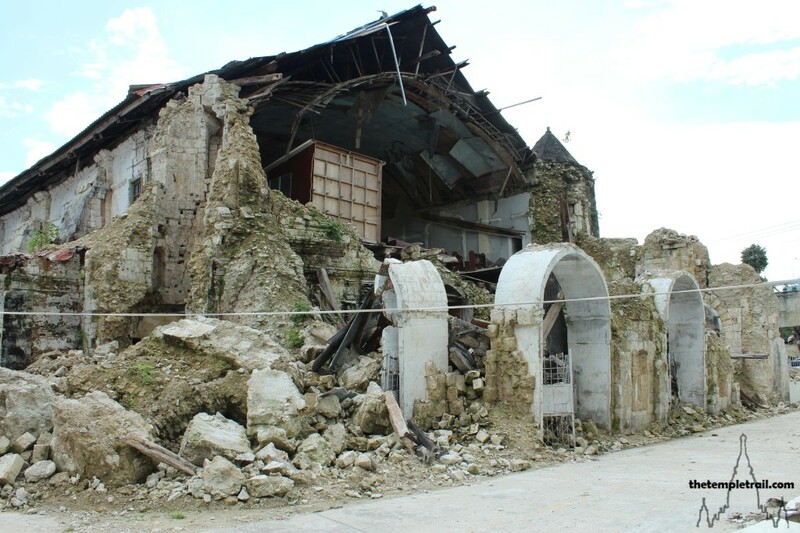 The churches at Baclayon, Dauis, Dimiao, Loay, Loon and Maribojoc were all damaged, making it the most widespread carnage in Bohol’s tempestuous history. Of these, four are National Cultural Treasures, due to their cultural and architectural importance. The Church of Our Lady of the Immaculate Conception at Baclayon, the Church of San Pedro at Loboc, the Church of Our Lady of Light at Loon and Santa Cruz Parish Church at Maribojoc were all considered to be jewels in the treasure chest of Bohol. The earthquake dealt a terrible human tragedy with more than 200 dead and more than 14,000 homes destroyed. On top of this, two of these four great churches were totally razed to the ground, one was almost completely ruined and the other suffered very bad damage to its façade. 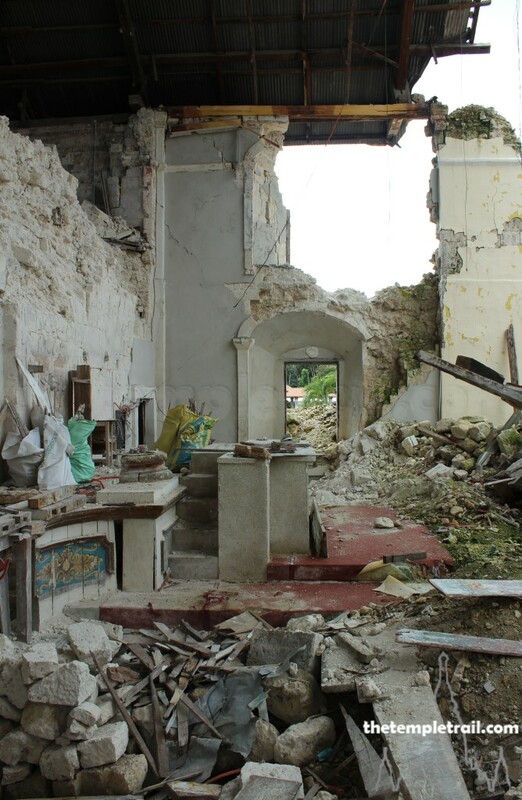 While many newer churches made from reinforced concrete were also affected, the loss of the old churches has really inflicted a blow to the people of Bohol. 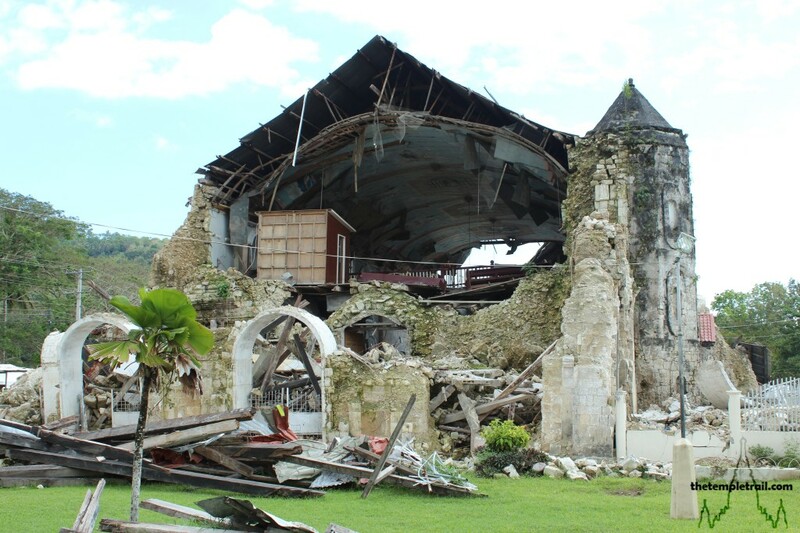 The worst was done to the churches at Maribojoc and Loon, both of which were annihilated by the tremor. The first church at Loon was built by the Jesuits in the 1750s, but this was replaced by the Augustinians who didn’t like the building or the location. Originally, a chapel was constructed under the supervision of Fray Manuel de Elizalde in 1753. The Augustinians then built their first in 1812, but this subsequently burnt down in 1850, leaving only the façade. The church, La Iglesia de la Nuestra Señora de la Luz (Church of Our Lady of Light), was built again of coral stone and wood and completed in 1864. It was the biggest and regarded as one of the most beautiful on the island. It now lies as a pile of rubble for the second time in its history. 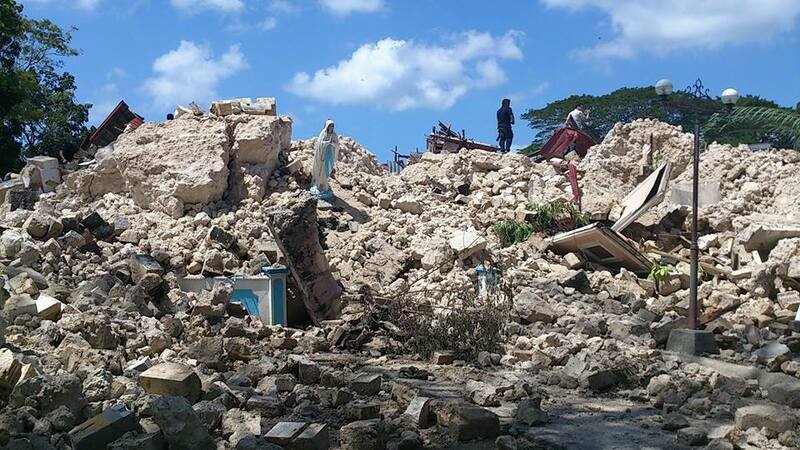 Also completely devastated was La Iglesia de la Santa Cruz (Church of the Holy Cross) at Maribojoc. Again built by Augustinians on an 18th century Jesuit structure, the first incarnation of the Augustine church was completed in 1816. It was then replaced in 1872, under the leadership of Fray Fernando Rubio, with a grander, yet somewhat delicate neo-Gothic structure with native decorative elements. Beautifully painted inside by Cebuano artist Raymundo Francia, and housing one of the most elaborate neo-Gothic retablos in the Philippines, it was a time capsule that has been lost to the world. La Iglesia de la Inmaculada Concepción de la Virgen Maria (Church of the Immaculate Conception of the Blessed Virgin Mary) in Baclayon suffered the least of the three. One of the most iconic, its damage is the most easily repaired. It is one of the oldest and has had three incarnations, one thatched chapel in the late 16th century, a stone Jesuit church completed in 1727 and a 19th century renovation by the Augustinian Recollects. The earthquake badly damaged the façade and bell tower of the church, but the interior had a lucky escape and the structure is relatively sound. 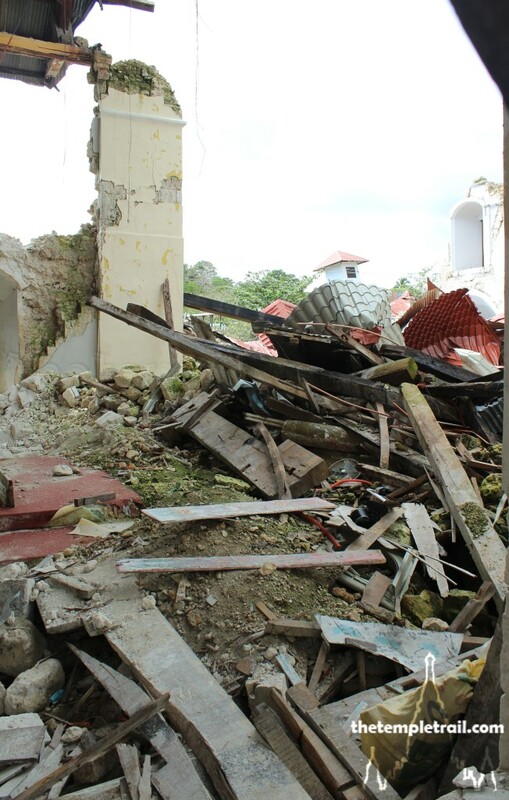 The main obstacles facing the rebuilding work are money and technology. While the money will be raised in the long run, the techniques used in the original construction are largely forgotten methods. Research will have to be done in order to successfully restore the glorious façade. While there is at least a strong glimmer of hope for the church at Baclayon, the story at Loboc is not quite so optimistic. La Iglesia de San Pedro Apóstol (Church of Saint Peter the Apostle) was initially built by the Jesuits in 1602 when they moved their administrative headquarters from Baclayon to Loboc following a raid by Muslim Moro marauders from the south. This church burned down and was replaced in 1638. A large stone church was then constructed in 1734 by the Jesuits, prior their expulsion from the Spanish domains. The final incarnation was finished in 1896 by the Recollects. Even prior to the earthquake, the church was at risk. Bad planning had a large concrete bridge on the verge of cutting through the church, but fortunately construction halted before causing damage to the building. What the bridge didn’t do, the earthquake did and the portico-façade, transept, high altar and roof were almost entirely annihilated. The damage is terrible, but there is still a chance for Saint Peter’s. Despite the large scale damage, at least it is not as bad as at Loon and Maribojoc. 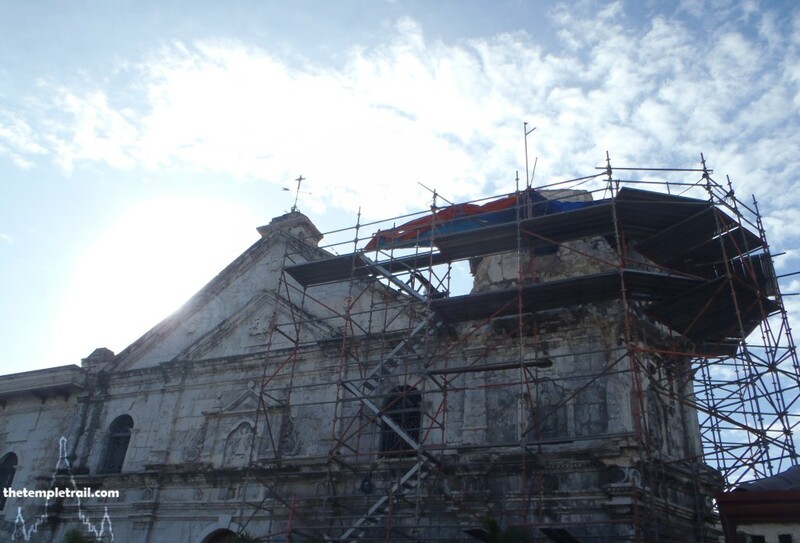 It will require serious funding and effort, but with those, there is a possibility of restoring the grand old church of Loboc. 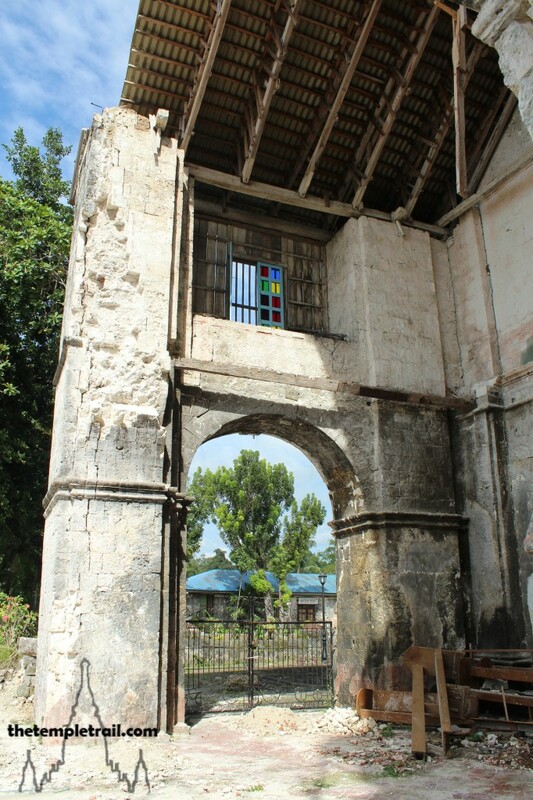 Outside of the big four, there are numerous others, such as La Iglesia de Nuestra Señora de la Asunción (Church of Our Lady of the Assumption) at Dauis on nearby Panglao island, the fifth incarnation of a church there, dating from 1898. The sophisticated Baroque and neo-Gothic church suffered damage to its façade and transept. La Iglesia de Santísima Trinidad (Church of the Most Holy Trinity) in Loay, built in 1822 and renovated in 1889, lost its entire portico in the earthquake. The question now arises regarding how best to proceed. For some like Baclayon it is a matter of rebuilding a section and trying to retain the integrity of the original. There are dangers in this. The church at Jagna, having been damaged by a typhoon in the 1980’s, was heavy-handedly repaired with cement, losing much of its artistic feeling. On the one hand, restoration to the original look is very appealing, but that is a very difficult task to achieve, as any work done will look modern. A possible solution could be to embrace the modern and nod to the ancient in a kind of fusion of the styles. While at Baclayon, this may not be the best option, it could be at some of the more heavily damaged sites. At Loon and Maribojoc, where the devastation is so epic, the options are limited, yet somehow open at the same time. Since a restoration is neigh impossible (at least using the original fragments), other ideas need to be pursued. A totally new structure that incorporates what can be salvaged and retaining any surviving ground-level stonework could work as a solution. For Loboc, the answers do not come easily. Many will want a full restoration, while others may argue that it may be an implausible dream. The issue is that the site is in limbo somewhere between total destruction and superficial damage. Only time will tell as to the correct course of action. There are two certainties and positives, however, which can be taken from the devastation. Firstly, this is not the first time in any of those churches’ histories that destruction has been rained down on them. In every case, the church is a later incarnation of an earlier structure. Secondly, the reason that the churches have risen time and time again from the ashes, is the devout faithfulness of the Boholanos. The churches are far more than buildings to them. Already at Loboc, an outdoor church has been set up next to the ruins of the stone structure to cater to the spiritual needs of a people who have suffered worse than any building can. They take strength from their religion; it is an infections positivity mixed with amazing pragmatism that really singles out the people of the island. For outsiders, it is very easy to debate the merits of what to do with the ruins, but ultimately it is a decision that the local church, in concert with its flock must make. While the sites are part of a global heritage, they are first and foremost active spiritual places of worship that belong to the people of Bohol. All we can do is provide assistance to them to control their own destiny, whether that be financial or technical. It is up to the Boholanos to do with that what they will and push forward into the next phase for the iconic stone churches of Bohol.